Snow’s BBQ on a foggy Saturday morning in Nov. 2009, this was the Posse’s first of many trips to the BBQ mecca. Left to right, original Posse members David Guzman, Jesse Hart, Chris Wilkins and Gary Barber taste the goodness of Snow’s BBQ brisket for the first time. As a group, we consider ourselves fairly sophisticated about smoked meats. We follow Daniel Vaughn’s Full Custom Gospel BBQ blog. A couple of us have well-thumbed copies of Texas Monthly‘s June 2008 issue rating the 50 top places in the state. In it, Snow’s is No. 1. 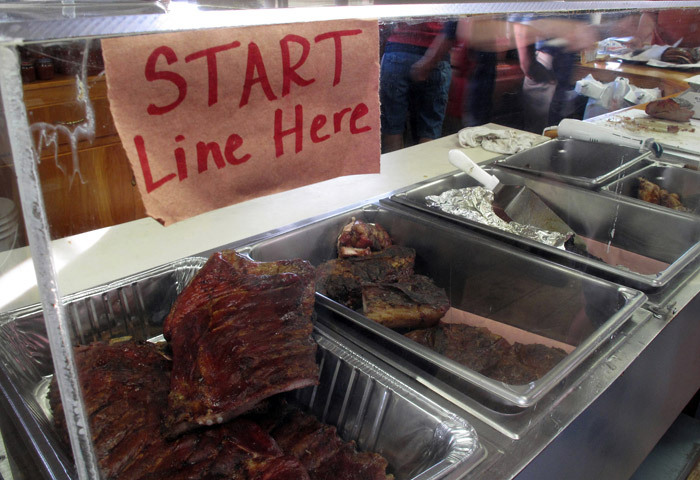 Until then, it was largely unknown among barbecue fans. 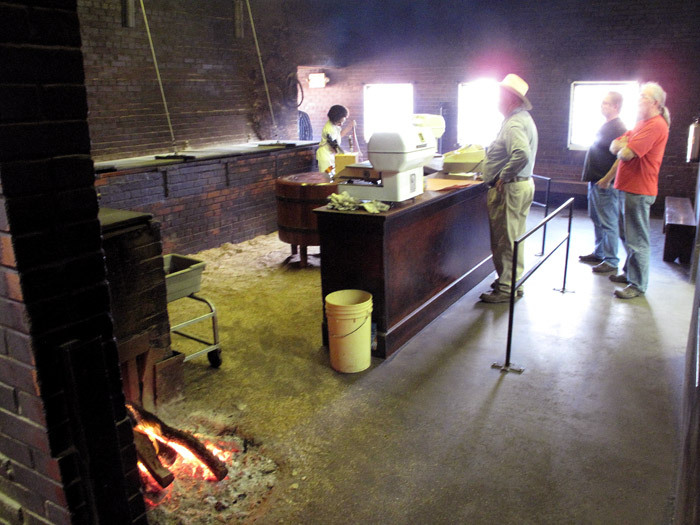 The serving line at Snow’s BBQ in Lexington. The Posse’s first meal at Louie Mueller Barbecue in Taylor. Clockwise from left, David Guzman, Chris Wilkins, Gary Jacobson, Jesse Hart & Mike Gibson. 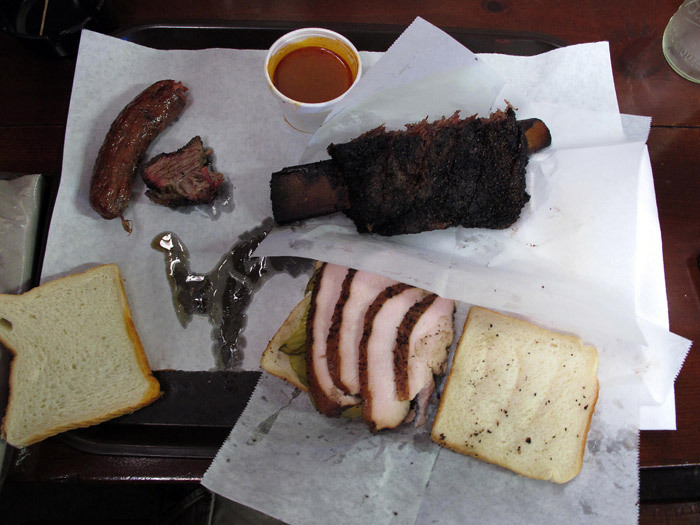 Some of our meal at Louie Mueller Barbecue in Taylor, beef sausage, brisket, beef rib and smoked turkey. The serving line at Smitty’s Market in Lockhart. 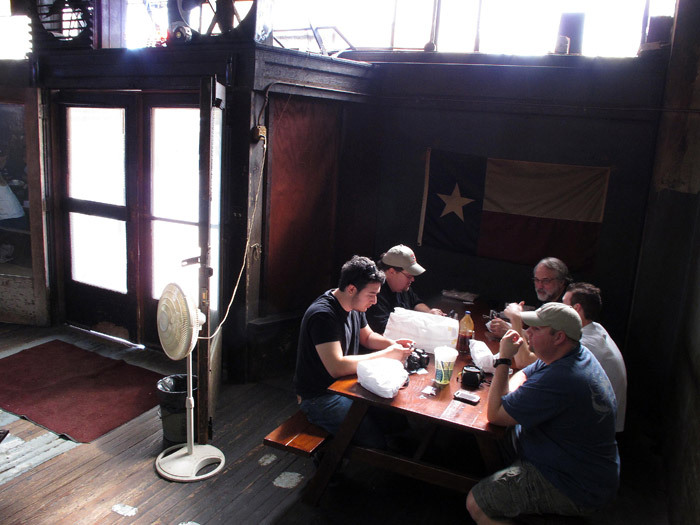 The original Texas BBQ Posse at Snow’s BBQ in Lexington, 2009. Left to right, Mike Gibson, Gary Barber, Jesse Hart, David Guzman, Gary Jacobson and Chris Wilkins.